Abstract: The study of light interaction with solid-state structures at a nanoscale provides unprecedented functionalities. In this talk, I will discuss several topics that engage the control of light at a small scale, both classically and quantum mechanically. Specific topics include: gain-loss modulated parity-time symmetric nonreciprocal isolator; a broadband hiding effect using topological nodes; passive radiative cooling/heating textiles; and the development of III-nitride quantum cascade devices. These topics highlight several novel capabilities of nanophotonic structures for applications in photonic integration, thermal control, infrared sensing, and beyond. Bio: Dr. Alex Y. Song is currently a postdoctoral scholar in E. L. Ginzton lab at Stanford University. 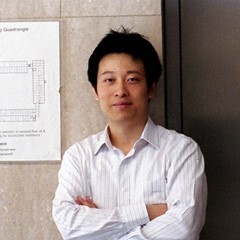 He received his Ph.D. in Electrical Engineering from Princeton University. He completed his B.S. in Mathematics and Physics, and M.S in Electrical Engineering at Tsinghua University.